On Thursday of this week, during the quarterly meeting TRS attends with the Coronado National Forest Supervisor, it was mentioned OHV users are riding on the large rock formation affectionately know as Chimney Rock. This rock formation (adjacent to FS Road 4431) has been signed and fenced as off limits to OHV use several times over the years, only to have the signs shot up or removed entirely and the fence taken down. There is a significant reason for keeping off the rock formation; it is a nesting area for eagles. So please spread the word, and respect this area by not riding your dirt bike, jeep, truck or side by side on the Chimney Rock formation. 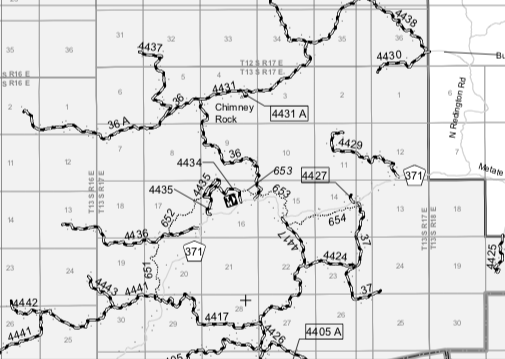 The Catalina Ranger District has a plan to reroute FS Road 4431 a safe distance away from Chimney Rock. No idea when that reroute will occur. Map identifies Chimney Rock. Reference, 371 is Redington Road.